When checking someone's dilation, there can be a number of findings in the outer periphery of the eye that have no affect on the person's vision. That's why dilation or fundus photography like Optos are so important to the ocular examination -- changes in the eye don't necessarily cause changes in vision. 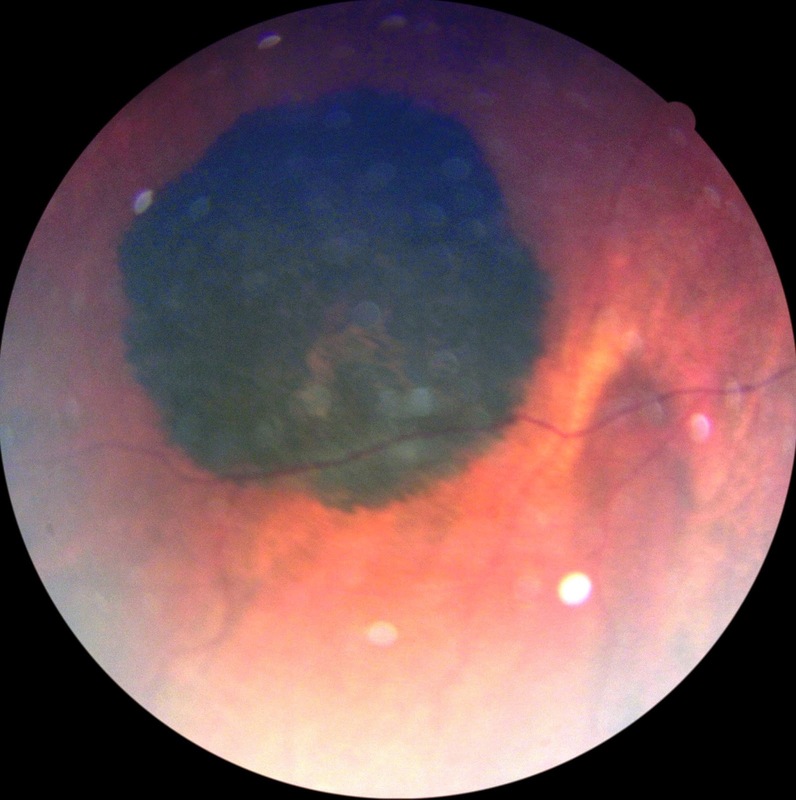 Today we explore a relatively common ocular finding, congenital hypertrophy of the retinal pigment epithelium (or CHRPE for short). 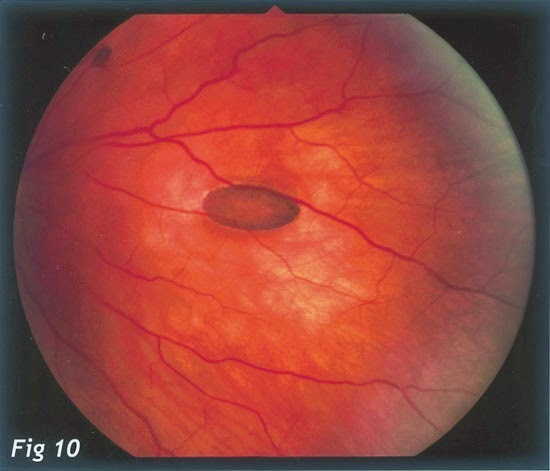 CHRPE as viewed by off-axis fundus photography. This picture was taken by me which explains why it is not that great. All of the white spots are artifact. CHRPE is a pigmented area in the outermost retinal layer (the retinal pigment epithelium), which means that is located underneath your retinal photoreceptor cells and your blood vessels. That is why you can see your vessels run so clearly over top of the lesion in photographs. Color is commonly either black or brown, but they can also be without pigmentation and exist as a lighter gray lesion. The borders are distinct and typically circular or oval in appearance. In about 50% of lesions you will see lighter colored areas within the darker lesion called lacunae. These changes are also harmless and normal. More lacunae can develop with time, and these changes are not associated with any tumor risk. Typically they are found as single lesions, but they can also exist in larger groups (called bear tracking). The overwhelming majority of CHRPE are benign, or 100% harmless. They typically stay the exact same size your entire life or grow very slowly and without any elevation. In very rare instances, they can be associated with adenocarcinoma of the retinal pigment epithelium, so we always track any finding in the eye for changes in size, shape and appearance. Suspicious findings for tumorous changes would be feeder vessels to the lesion and elevation of the lesion due to subretinal fluid build-up. 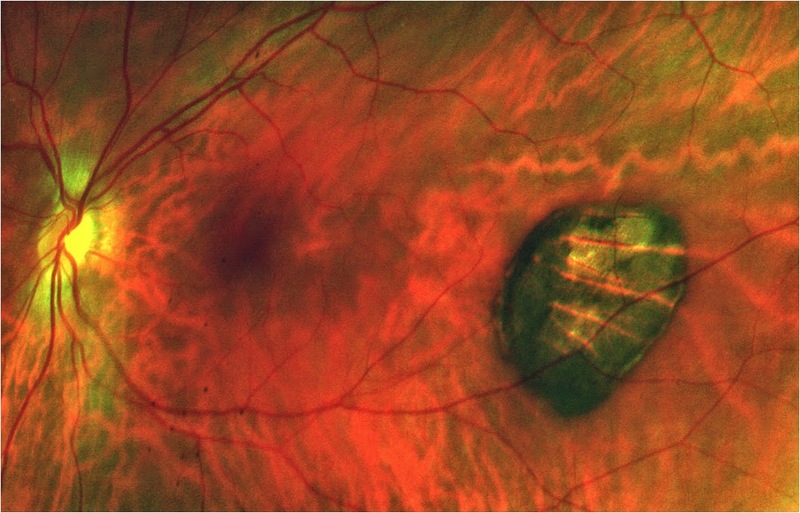 These are much more rare than choroidal melanoma as a possible (and still rare) risk for choroidal nevus (read more here). 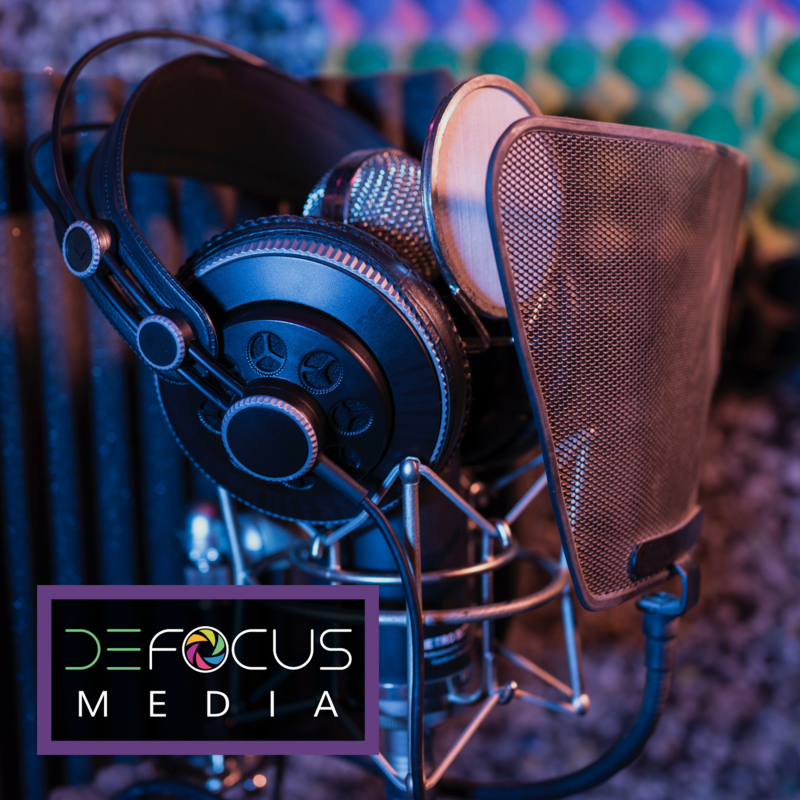 If you have a CHRPE, your doctor will use either photography or dilation (or both) to check for changes with time to make sure that yours is completely harmless and normal. Not all CHRPE are associated with Gardner's Syndrome colon polyps, just this atypical, multiple CHRPE variant. Your doctor will tell you if you have a normal CHRPE or the type that is more suspicious, and if a referral is needed for investigation for colon polyps then your doctor will help make this transfer of care. Gardner's Syndrome does run in families (autosomal dominant) so a family history would put you at higher risk of having these changes.